Delicious homemade funfetti cupcakes are so easy to make and perfect for just about any occasion. 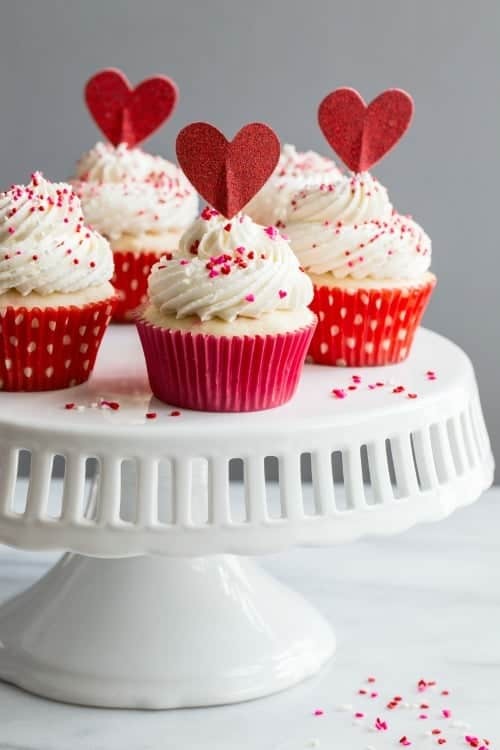 These cuties are dressed up for Valentine’s Day, but they’d be just as cute with green sprinkles for St. Patrick’s Day! Happy Valentine’s Day! Today I’m coming at ya with a delicious and easy recipe for homemade funfetti cupcakes. If you read MBA on a regular basis, you know I’m not one to diss a boxed mix, but I have to say homemade funfetti cupcakes are so much better. And they’re almost as easy! Since we’re just about a week away from moving into our new home, we’re keeping Valentine’s Day low key this year – well, really, we keep it low key every year. We’re headed out for an early dinner with Elle, and then hitting up a few home improvement stores to browse lighting fixtures and cabinet hardware. We’re fancy like that. And if I’m being honest, Elle and I don’t really need a giant bouquet of roses and expensive dinner to know how much Eric loves us. I mean, he cleans the kitchen after I bake up a storm, makes me heart-shaped PB&J sandwiches on the reg, and changes the majority of Elle’s diapers. That right there, that’s love. 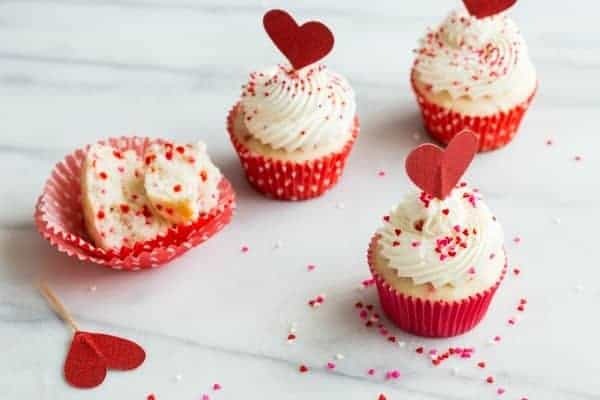 When I was thinking of a few Valentine’s Day desserts to share with you, funfetti cupcakes immediately made the list. Let’s be real, who can resist bright, sprinkled-flecked cake? Certainly not this girl. Add on a swirl of buttercream and I’m pretty much in cupcake heaven. The great thing about homemade funfetti cupcakes is that you can customize them for pretty much any occasion. Just add different colored sprinkles into the batter, tint your buttercream a fun, festive color and you’re good to go. Think of all the possibilities! What are you up to for Valentine’s Day? Center a rack in the oven to 350 degrees F. Line cupcake pan with paper liners. In the bowl of a stand mixer fitted with the paddle attachment, or with a hand mixer, beat the butter and sugar at medium speed for 3 minutes, or until the butter and sugar are very light. Add in the vanilla extract and one third of the flour mixture, still beating on medium speed. Beat in half of the milk-egg mixture, then beat in half of the remaining dry ingredients until well incorporated. Add the rest of the milk and eggs, beating until the batter fully incorporated and smooth, then add the last of the dry ingredients. Once ingredients are thoroughly incorporated, give the batter a good 1-minute beating to ensure that it is thoroughly mixed and well aerated. 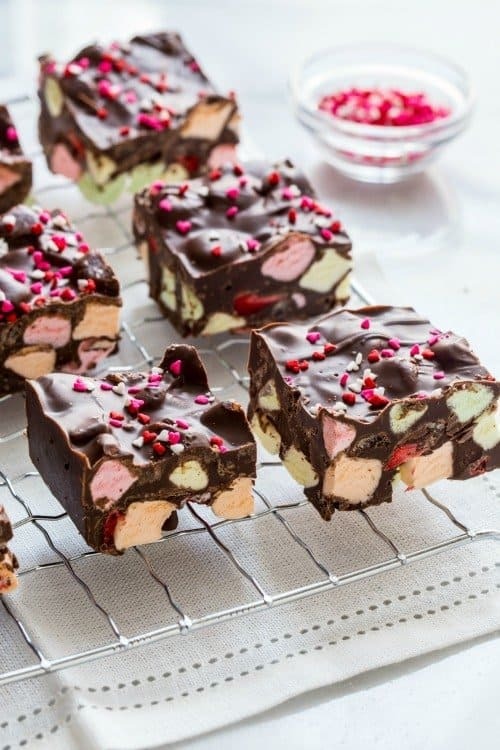 Use a rubber spatula to fold the sprinkles into the batter. Using a large scoop (about 3 tablespoons), distribute the batter between 18 muffin wells, filling each well 2/3 full. Add in vanilla, and 1 tablespoon of heavy cream or milk. Blend on low speed until moistened. Add an additional 1 to 2 tablespoons of heavy cream or milk until you reach the desired consistency. Beat at medium-high speed until frosting is smooth and fluffy. Recipe slighted adapted from these delicious Vanilla Bean Cupcakes which are adapted from Dorie Greenspan's Perfect Party Cake. Craving More? 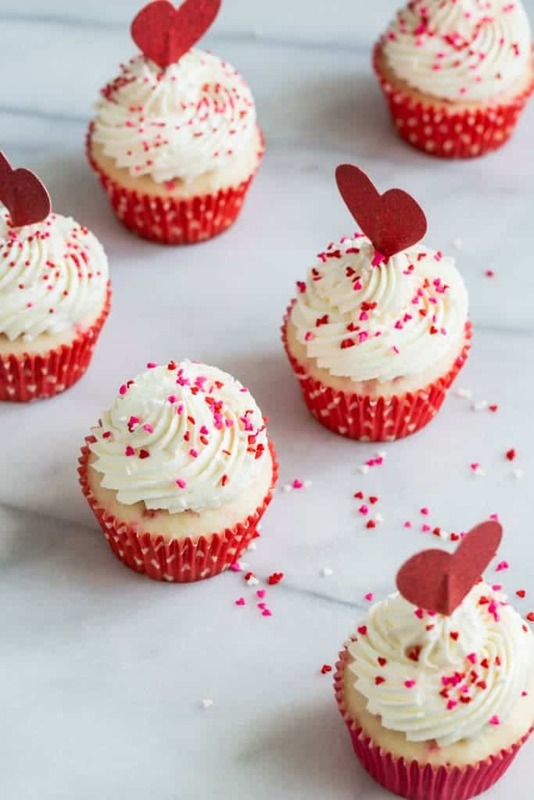 How about these lovely Valentine’s Day Desserts? 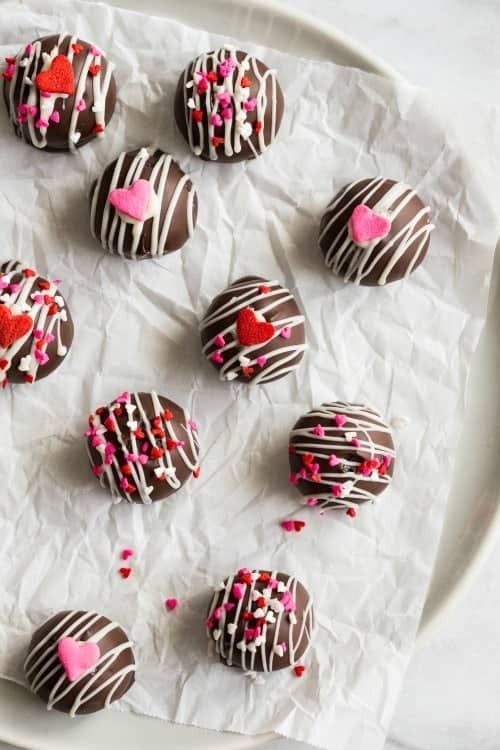 These would be so perfect for a Valentine’s party! If only we got to have those in the working world like we did in elementary school! You are so right, we should have “school” parties at work too! Thanks for visiting. Sprinkles just seem to make everything better, don’t they? Thanks for stopping by. These cupcakes are absolutely adorable! Pinning! Thanks so much, I appreciate you stopping by. These are so adorable! If only I was that good at decorating cupcakes too haha! It just takes a little practice. Thanks so much for stopping by. These cupcakes are so cute. I love all things red and pink now and probably will long after Valentine’s Day. Lovely! All of them look so amazing! Just perfect! They look so cute and stylish. These just came out of the oven and I can’t get over how fluffy they are! Love this recipe! One question though. The latter half of the cupcakes came out to be a weird color because all of the sprinkles melted into the batter. Any recommendations for sprinkles that will hold up better? Thanks so much for sharing! 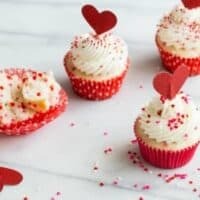 Can you make these as mini cupcakes? You sure can, you’ll just need to adjust the baking time. I’d start checking them after about 8 minutes. My guess is they’ll bake up in 10-15 minutes. I hope this helps. 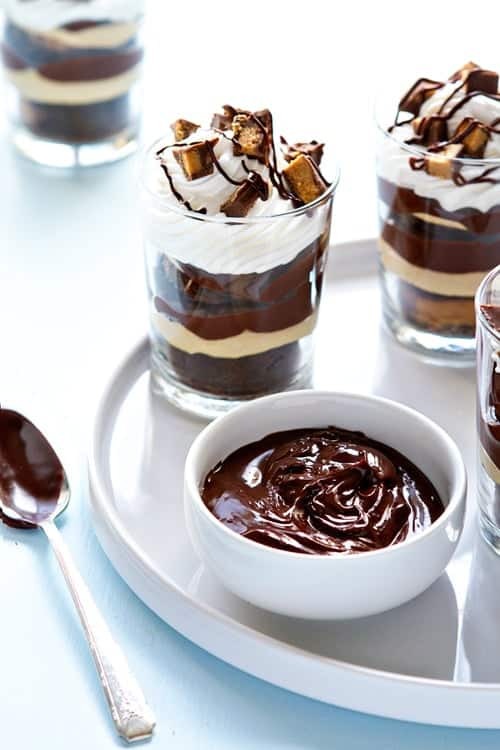 These looks so cute and delicious! I was wondering, can I use whole eggs instead of egg whites only? Thanks!! I have not tried this substitution, but it will definitely change the texture of the cake if you include the egg yolks. I have tried many funfetti cupcakes, some good some bad; but these are THE BEST EVER!!! So light & fluffy. Thank you for this awesome recipe, looking forward to trying more of your recipes. Thank you, Cheron! I’m so glad you liked them! Hi, Elizabeth! I think the magic to a cake recipe is having a balance of ingredients. While I don’t advocate mixing a cake to death, mixing until incorporated and the batter is smooth leads to a fantastic looking and tasting cake. I’m so glad you enjoy them! Thank you for your kind words.